A former British Prime Minister famously announced his three priorities as “Education. Education. Education.” Education is a basic human right and is important for building a nation State. Equipping our people with basic numeracy and literacy allows them the means for personal development, to build citizenship and civic identity as well as to foster a national identity. Education allows our people, especially our children, to grow to achieve their capabilities and provides them with hope for a better future. Learning is an on-going process and for this to be effective quality basic education is of paramount importance. Education remains the most effective tool for economic and social mobility. With investments in education we build the human capital stock of Papua New Guinea that can drive shared prosperity in the future. Achieving universal basic education raises the policy trilemma of the three C’s: coverage, cost and choice, where policymakers can only choose two of the three goals to concentrate on whilst limiting the third. For education and primary health care, the government policy has been to target universal coverage whilst controlling costs – this has limited choice. The massive growth in student numbers under the O’Neill Government’s tuition fee free policy has allowed improvements in access to basic education addressing the coverage goal whilst trying to contain costs. But this has resulted in a detrimental impact on the quality of education with over-crowding of classrooms, teachers overworked, insufficient school tables, books and other material for students and inadequate school infrastructure. The ultimate consequence of these factors may be to jeopardize the quality of education that the children of Papua New Guinea receive. The adverse impact of this in turn will be felt for many years to come. These concerns has been noted by the NEFC (see here) and echoed more recently in a careful analysis by NRI just this month (see here). Given all these challenges one wonders whether the front-line of delivery for Government is poised to carry the increased burden of an important government function. 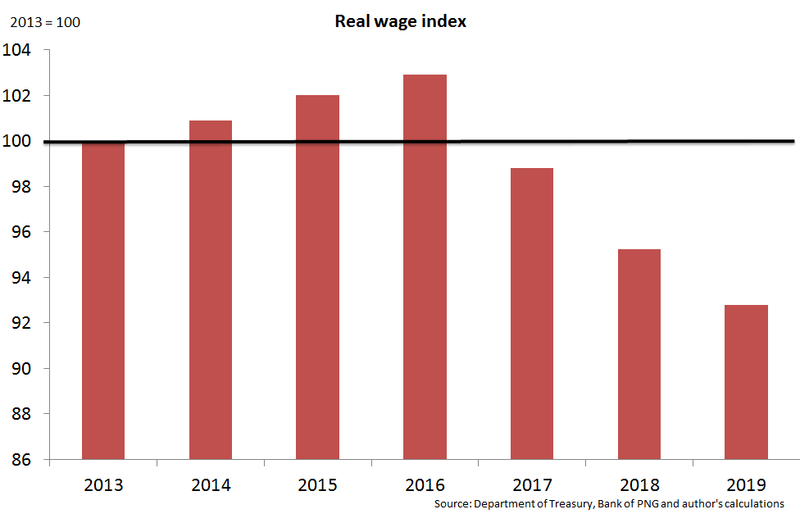 Late last year the O’Neill Government, through the Secretary for Department of Personnel Management, negotiated with the PNG Teachers Association for teachers to receive an annual wage increase of 3 percent for the years 2017 to 2019 arguing that the difficult economic conditions and financial conditions for the Government constrained its ability to pay more. Shortly afterwards the O’Neill Government negotiated the same wage rate increase of 3% for public servants. 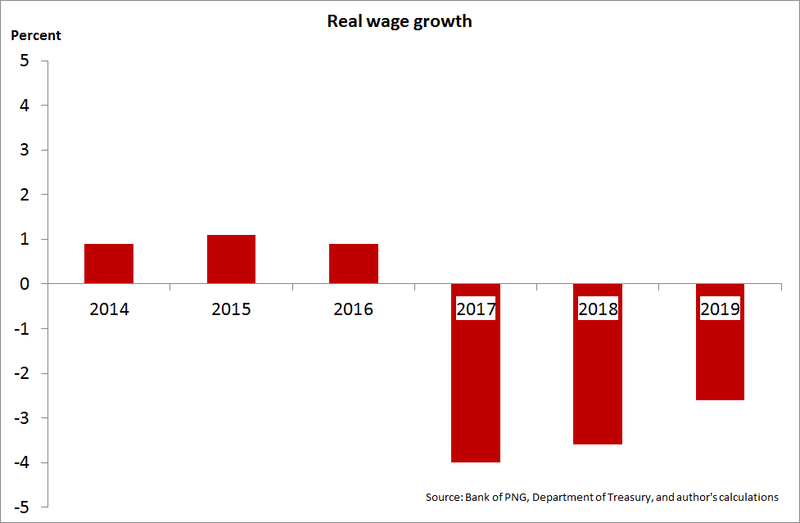 Whilst the Government’s statistics for economic growth show a slowing there is still positive growth refuting the arguments put forward for wage restraint. There has been considerable debate as to the reliability of the Government’s GDP numbers but the official Government budget forecasts show positive growth rates. For the period 2017 to 2019 the O’Neill Government has projected an average (geometric) economic growth rate of 2.7%. This is the growth rate after adjusting for inflation and is lower than the highs in the period driven by LNG construction and the commencement of LNG production but is still a number that other countries would welcome. Apparently the O’Neill Government has also used arguments of the Government’s difficult financial position in the negotiations to support lower wage growth. This is directly contradicted by the official statistics in the 2017 National Budget that show more reasonable real increases are possible. The Government has continually trumpeted that it well within the ceiling deficit ratio of 30% of nominal GDP mandated by law. If these figures are believed and used it shows the estimated maximum average funding available to fund teachers and public servants is close to K1 billion each year (see Exhibit A). 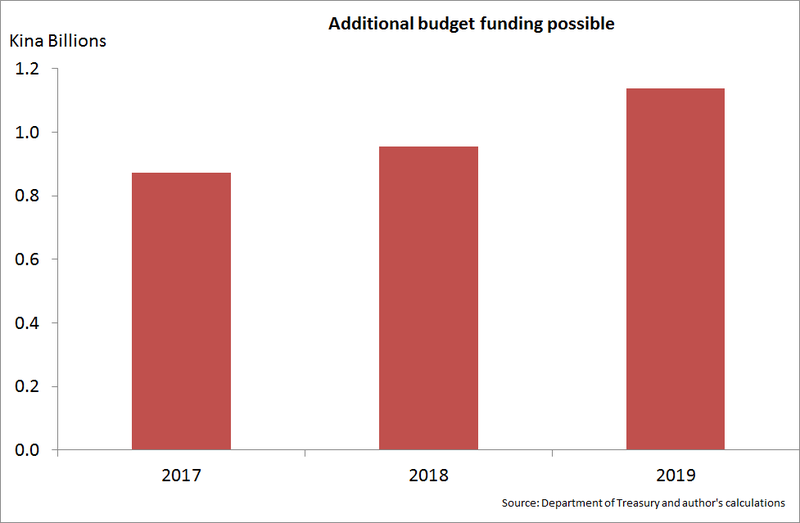 This is computed as the additional spending allowed before the 30% debt ratio limit is reached whilst holding revenue at the budget estimates. In Exhibit B the change in real wages for teachers and public servants are shown. After receiving modest but welcomed increases in real wages over the last three year both teachers and public servants are now being forced to swallow the bitter pill of much needed economic adjustment. Our country has experienced a significant reduction in its terms of trade that is the ratio of prices of PNG’s export to prices of PNG’s imports. This has translated into a large decline in the national income of PNG but the Government supported by the Bank of PNG have failed to take corrective measures to address a widening gap in public finances. The government failed to show budget restraint by paring back spending that mid-way through this Parliament term ballooned to unaffordable levels 50% higher (nominally) than it inherited. This growth in spending has not always supported productive investments and has in fact stretched government resources thinly and reduced development returns. The Bank of PNG whilst regularly sounding warnings in its official statements for restraint in public expenditure in excess of government revenue has nonetheless fed the insatiable appetite of Government for spending by effectively printing money to finance this deficit. Last year alone the BPNG lent the O’Neill Government a staggering K1 billion confounding its role as an independent monetary authority responsible for curbing excessive monetary growth. For a small economy like PNG that relies on trade, the exchange rate of the Kina usually follows our country’s terms of trade so the real exchange rate adjusts to keep our economy internationally competitive. This hasn’t quite happened as the BPNG has intervened in the domestic foreign exchange market seemingly to allow a gradual adjustment of the Kina’s external value. The pace of adjustment has been too slow so that the needed expenditure switching away from imports and reduced aggregate demand has led to the hemorrhaging of international reserves. This has in turn forced the imposition of a band by BPNG within which foreign currency is bought and sold. This has led reportedly to commercial banks’ order books of foreign exchange building to levels of over K1.5 billion. With such a large economic shock from PNG’s falling export commodity prices there has to be some adjustment. The Government is not reducing public demand sufficiently with continued excessive budget deficits and the Bank of PNG is feeding the Government binge with huge monetary financing of the deficit and not allowing the exchange rate to act as a buffer. So where is the adjustment coming from? With so much pressure an implosion is now taking place and some outlet is needed to relieve the pressure. An area that it being forced to bear the brunt of economic adjustment are public sector real wages. Public servants and teachers are being forced to accept their purchasing power reduced over the next three years so their real income will is projected to be 7% less than it was in 2013, as shown in Exhibit C. This is a staggering and unfair reduction. So the O’Neill Government has not only planned to reverse the real wage gains achieved from the increases in the previous salary fixation agreement but plans to extract a pound of flesh as well. It can be easy to understate the wider economic costs of a real income decline for public servants and teachers as they support a broad and extended family network. Our people back in our villages rely on those privileged few that have formal employment to assist with sustenance and the cultural obligations that continually present themselves. The hardship of cuts to real incomes may be pronounced and wide-spread. With the roll-out of the tuition fee free policy there has been an implicit expectation of an increased productivity of teachers and schools in dealing with the enormous burden imposed on them. The PNC Party boasts of an increase in children in school to 2 million today by 1 million from 2012. Such an increase is commended. To gauge the gross productivity increase expected of teachers consider that to achieve a doubling of students numbers over the period 2012 to 2016 an annual average increase of nearly 20% would be required. So why does the Government expect teachers and public servants to take such a huge real pay cut as a consequence of Government financial mismanagement. It beggars belief that the front line of delivery for such an important development goal and basic human right, our teachers, is being asked to do more work for less pay. Wage increases should match productivity growth at the minimum and yet the O’Neill Government wishes to penalize teachers. The decline in national productivity if the quality of education falls will be felt in decades to come. Of course, I don’t believe that the budget can accommodate an additional K1 billion increase in spending. I don’t think that the economic and fiscal situation presented by the Government is accurate either. I do feel strongly however that the economic and social costs of a poor quality education outcomes are not worth squeezing our teachers. An immediate reprioritization of expenditure, within constrained public finances, to support quality education is needed. Our teachers deserve better income treatment and better working conditions but most of all our children deserve the promise of a better future that a quality education can bring. Note: The Sunday Chronicle article was finalized before the 2016 Final Budget Outturn Report was released by the Minister for Treasury. This report shows that the O’Neill Government breached the 30% debt ratio limit set by law. 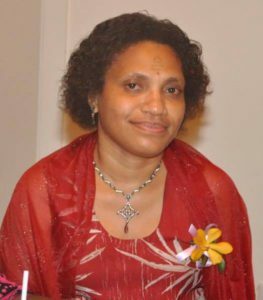 Hi Mom Kessy, Great insight into the Current Governments’ Administration of this Beautiful, Resources rich country Papua New Guinea and yet we are poor. It all comes back to the Leader of the day (Prime Minister) as the saying goes “Everything rises and falls on leadership,” says Dr. Maxwell, “.